I really liked this book, and thought it was good. It was, in my opinion a very good, but different retelling of the story Cinderella. I have to admit, I am a Donna Jo Napoli fan, and thought she did a very good job with this book. She followed closely to the Cinderella story line, but yet made it her own, in that you forgot at certain points that it was in fact a Cinderella Story. I liked the way she weaved the story, though once again, it had a little to much of ancient Chinese religion in it. But other than that, I really liked this book, and would recommend it. "Xing Xing is a small child who is coping with the recent death of her kind-hearted potter father. Her mother died years ago from illness, which forced her to live with the stepmother her Father had married with her Half-Sister Wing-Pei. 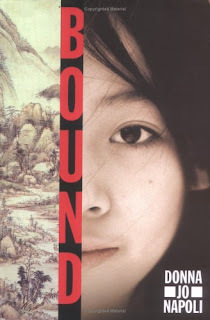 The "Family" lives off selling what remains from Xing Xing's Father's collection of unsold pottery, Xing Xing fears she may be sold into slavery once the supply runs out as her step mother as threatened her with. Step Mother's increasing vainity is shown early on by her obsession with Wing-pei undergoing the painful procedure of "feet binding". Feet Binding is a painful procedure where all the bones of a womans foot are shattered via blunt-force trauma and re-arranged as to appear smaller and more "beautiful". Xing Xing's Father was greatly against such a horrific procedure, but now against his wishes his daughter Wing-pei is put through it. Xing Xing finds solace and seculsion from the torments of Stepmother who forces her into servitude and border-line slave work through practicing chinese writing "Caligraphy" as well as reading and seeing "Mother Fish". Mother Fish is her pet of sorts who seems to be a reincarnation of her late mother. The book depeicts Xing Xings' struggles as well as an adventure she must go on for the sake of Wing-Pei. Xing Xing begins to learn the ways of the world and through her own cunning and intellect learn a way out of her horrible prediciment."